Is It Better to Shut Down, Sleep, or Leave a Mac Turned On When Not Being Used? When it’s not in use, do you shut down your Mac, put it to sleep, or just keep it turned on? Is one choice better than the others? Why and why not? These are great questions, so let us review the choices and why you may want to choose one over the other. This is my preferred choice because it provides for the easiest and fastest way to resume work while still maintaining hardware. It’s practically instantaneous to sleep a Mac and when you wake it up all of your open apps, documents, window arrangements, and web pages, are exactly where you left off with practically no delay. For the average Mac user who wants to quickly get back to what they were doing, sleeping is perfect. If you use the Mac every day, simply putting it to sleep when it’s not in use or overnight is probably the best choice. Just be sure to remember to reboot every once in a while to allow system software updates to install as part of a general maintenance routine, though waiting for an OS X Update or Security Update is generally a sufficient time between reboots. You can also gather some gigantic uptimes with this approach which is pretty much a useless statistic other than the nerdy bragging rights, (I’m currently at 35 days, weeeee!) but hey it’s fun to check anyway. I basically never shut down a Mac unless it’s going into a longer term state of inactivity or storage. Shutting down a Mac is slower since all open applications and documents have to quit, and then when you turn the machine back on everything has to re-open again to get back to where you were prior to shutdown. OS X Lion made resuming past application states much simpler with the automatic window restore feature (which some dislike and choose to disable), but I still find it too slow to be usable for my instant-on demands. For the power conscious or for those trying to squeeze the absolute longest lifespan out of hardware and hard disks, shutting down when not in use is the best choice. This is also what you’ll want to do if you’re going to put a Mac in longterm storage, won’t be using it for a longer than a few days, or if you’re going to be traveling with a Mac that isn’t in use during the travel period. Leaving a Mac constantly turned on is another viable option, though I think it’s best reserved for Macs that function as servers. This approach also carries the most polar advantages and disadvantages. On the plus side, you don’t have to bother resuming anything since it’s already on, you can schedule all maintenance and backup tasks to occur in the wee hours of system inactivity, and it allows for something like a constantly available SSH server or media center to be running on the machine. The downsides are basically the constant power consumption and the constantly active hardware, which can limit overall lifespans of the computer components. If you’re running a server or media center, leaving a Mac turned on constantly is a no brainer. For the casual Mac user, it’s probably best to put a Mac to sleep when it’s not in use though, it gives hard drives and fans a rest, and will generally lead to a longer lifespan of the computer. What do you do and why? Let us know your thoughts and habits in the comments. I am a shut er down type guy, BUT only because of the SSD I put into my MacBook Pro. My wife shuts the lid so it goes into sleep, hate that! I do a little of the first two. During the day I put it to my screensaver when I’m not using it, which then goes to sleep in about 15 mins. I find a hot corner very helpful for this. My Mac Pro at work, I have is scheduled to sleep after the work day, on weekdays then have it wake up right before I get into the office. While it is sleeping, I use wake-on-LAN via LogMeIn to wake it up and then it goes back to sleep after I log out. I do this because sometimes when I leave work, I need to get files in one of the hard drives inside. Although there have been times I needed to get into it on the weekend and I was basically screwed because it was completely off. What do you use to schedule your mac to go to sleep at specific times? Is there an app or just something within OSX that you use? You can schedule your Mac in the Energy Saver section from System Preferences. I have to say I agree with you pretty much 100%. Having worked on and used computers over a span of over 40 years my experiences are in line with yours. One point you failed to make clear is that a leading cause of metal fatigue is the continual shrinking and expanding that occurs when these mechanical devices heat up and cool down. My experiences are that running things at as constant a temperature as possible is a good idea. Anyway, I do the same as you do. I allow my system to run 24×7 unless I am going to be gone for a couple of days and using a hot corner to sleep the display. I agree with leaving an iMac on constantly. A computer engineer told me some years ago, that the quickest way to shorten your computers life, was to turn it on and off every day. He said the constant heating and cooling of all the components by doing this, will lead to hardware failure 10 times faster than having it at a constant temperature. Needless to say, I have a 10 year old iMac (swivel screen) that hasn’t stopped from day one, and not one hardware change. your an idiot, Your mac is not an industrial computer that goes through high temp change. It is always good to turn off your computer if your not using it for a long period of time. Especially if your computer is connected to the internet constantly you might want to shut it down. People please use common sense. It’s not the Macro components, it’s the little components, especially capacitors, and IC’s. The heating and cooling of these stresses them like anything made from metal. This isn’t even something that is a revelation – I’ve heard many an engineer from companies (Epson, HP, Canon), all refer to this issue. Would I leave my machine on? No, I use standby to save energy, but anyone with commence knows that heating and cooling is what wears an electronic device out. How freaking rude and condescending, Ben w/your “Your an idiot.” in an otherwise friendly blog. Yuk! I agree with everything said. I also believe even with the advances in chip and circuit board technology the biggest stress on these “Non-moving” components come from power surges during the process of bringing a system up. So I think turning your system on a minimum of 365 times a year is not advised, power consumption issues aside. I have an 8 ½ yr old iMac which I’ve turned off Almost every day. I upgraded to a new one because my old one can’t handle to new OS w/out slooowwing it way down. It still works just fine. After reading this, I am never turning my computer off again. I will use display sleep from now on. I’ve also been a sysadmin for 10+ years and most of the machines I managed were server class systems. “Any sort of change or update isn’t tested until the system reboots to a known state” was one of the rules we used in my last contract. Those big systems didn’t have a ‘hibernate’ state like MacOS systems, so there was no sleep. I reboot periodically because I’ve watched my swapfiles grow to 2GB sometimes. Performance gets laggy and rebooting cleans that up. Also, in Safari and Numbers I’ve noticed that keyboard input stops responding sometimes in 10.6.8 and restarting those apps fixes the problem. So I tend to reboot and keep my system up and running all the time like it was a server. It runs Boinc and SETI@home when not in use, so I don’t feel like I’m wasting cycles. It never occured to me that reboots would fatigue a disk and shorten it’s life. Since most of the systems I managed were supposed to be up 24x7x365 unless a hardware/software change was needed, I never thought about that. and Ironically I rarely ever used sleep, when I decided to and thinking this is cool, one day it won’t wake up. (same cycle multiple times) You change system drives and your original drive is just frozen in a coma. Leave on – shut down twice a month (just because). I agree. Going back to the old days when computers were expensive, the companies I worked at promoted this same logic. Unless something has changed with the newest hardware I don’t see where this advice would be obsolete. I always sleep unless I have to do a system task that will take some time like virus scan, in that case I put the display to sleep. I also sleep the display when it’s just quick breaks. I use sleep exclusively and see no reason to shut down anymore. Think of the iPad and iPhone, they only reboot for system software and they never shut down. A Mac is becoming not so different. The hard drive wear/tear argument is irrelevant for those of us with SSD too. I currently have an uptime of 87 days, I think my last reboot was for OS X 10.7.3. Shutting down and booting up again is still a miracle cure for some of the quirkier problems that occur on computers. I say sleep but *reboot at least twice a week* to maintain optimal performance. Laptop users with SSDs should shut down instead of shutting the lid. You write the swap file to the SSD every time you go to sleep, even if you don’t get to 0% battery and shut down. It won’t write all 4G (or 8G, or whatever), but that’s still a lot of memory getting written to the swapfile every time. If I shut the lid 4 or 5 times a day I am generating more writes than I’ll do the rest of the day. The goal with SSDs is to minimize writes. With fast startup, startup isn’t that much slower than waking from sleep. If you’re running FileVault 2 (or otherwise dealing with sensitive, encrypted data), then you also need to shut down. Your system could be vulnerable to a FireWire or ThunderBolt DMA attack waking up from sleep mode. A clean boot eliminates that risk. If you have a SSD, just turn of “safe sleep” (Google for instructions). Then the RAM contents aren’t written to it when you close the lid. Sleep here with the occasional reboot, about once a week. I let my MacMini (mid 2011) to sleep. I restart it once a week. I put all my Macs to sleep. With Macbook Pro it is easy, just close a lid. However, my Mac Pro refuses to sleep on schedule (15 min of inactivity) and I have to force it to sleep manually by pressing Alt+Cmd+Eject. It is not a big deal, but anyway I would prefer just leave it knowing that it will go to sleep after some minutes. Even if my Mac Pro has SSD as startup disk I prefer sleep to shutdown, because even with relatively fast boot it wakes up faster and I reboot or shutdown my Macs only if it is absolutely necessary. 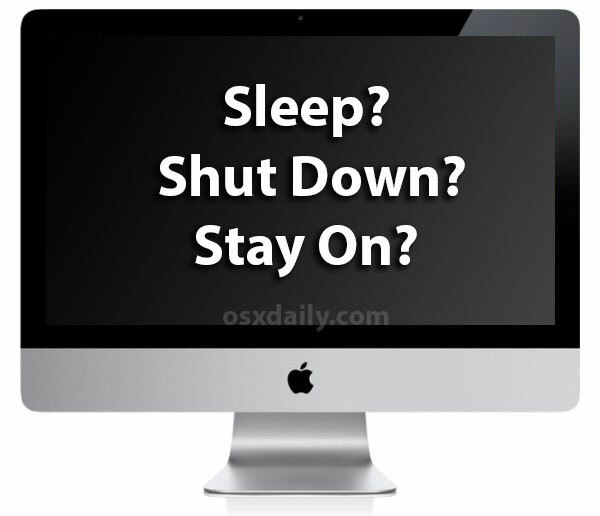 On my previous iMac I *always* used sleep instead of shutdown whenever possible. Then guess what? After 3 1/2 years it NO LONGER WENT TO SLEEP. It crashed every time I tried to sleep it. Short of getting a new motherboard, Apple offered no fix. So instead I just used a screensaver for inactivity, set sleep to “Never”, and that worked fine until I replaced the iMac. On my current (late 09) iMac, I sleep it during the day between periods of use, and shut down at the end of the day. Plus I put a dust cover over it at night. So I do believe that it is possible to overuse “Sleep” and I do NOT recommend it. I always leave my main MBP on & just use the lid close mode on my other.. no problems and is convenient. I agree with Lonnie Denison on this one. I have been in the electronics field for 43 years now and have maintained numerous types of computer systems over the years. I do NOT power my (currently) 5 different computers down unless I have to. While I do not have any system yet with a SSD drive, I have only experienced 2 drive failures in the past 8 years. Of those two drive failures, they have all failed after a power cycle. For those of you in thunderstorm prone areas, get a GOOD UPS. I can see how your failures might occur after a power failure but thats not necessarily due to the fact that you’ve powered it up and down regularly perse. I’m in the UPS business and with some of our more important customers they are stupid/paranoid enough to avoid shutting down the unit. On those units that have hardware, (fans and contactors), failure usually occurs because of under exercise. Contactor stick momentarily and the fans excessively wear the bearing race in one area only and when they cool and restart, well they don’t. I have to shut down, if I use sleep if my HD goes to sleep my Thunderbolt display doesn’t come back up.. I leave mine on all the time, it’s a laptop so I keep it raised up on a stand to add more airflow. Never had a problem, drive failure, or anything. Keep backups of course though! I leave mine on over the weekend when I’m home, otherwise I turn it off to save power but also to allow FileVault 2 to work at its best. If it’s off, the disk is fully encrypted, and unless someone can guess your key (or have the resources of the FBI or NSA), your data is safe. This is not the case if it’s asleep or on. Very well written article. Liked the well thought structure. I tend to let my Macbook go to sleep automatically. Have a dumb question: if your laptop is on/sleep, I assume you have it connected to the power grid? I’ll try that again! I generally turn off my computers over over night or when I finish using them. I even turn off at the power point to eliminate residual usage and standby powers usage of the other devices connect to the same powerboard. Since our computers can be off for days at a time and I never get up in the middle of the night to use the computer, this option makes sense for us. I don’t find the startup time an inconvenience as if I know I need to use the computer I’ll turn it on and do other things. My iMac only take around 40s to startup. While the points presented for sleeping are strong, just a [word of caution](http://hivelogic.com/articles/macbook-battery-is-toast-after-being-fully-drained/). If you’re battery gets “fully” drained (there’s a difference between just 0% and fully drained), when in sleep mode, I’ve heard scary stories. I have a MacMini (2011) as my main workstation. I leave it running 24/7 per the comments stated here regard excessive shutdown and startup. I have heard through others as well, knowledgeable about computers and heard elsewhere that excessive shutting down and starting up is not healthy for the hard disks. Another reason is because I have almost 15TB attached externally to the macmini, primary and backup drives. I would necessarily need to unmount those and remount them every time I wanted to shutdown. Also, I do scheduled nightly backups around 02:00 and 03:00 a.m. while I sleep. Those would not be accomplished if I shutdown. My 27″ screen attached to the macmini is set to screen save after 5 minutes and to sleep after 15 minutes and works just fine. Makes no sense to keep the screen on if not in front of the computer. The Macbook Air I keep closed lid (sleep mode) unless of course I am using then. Then, the same screen saver/sleep policy applies as stated above. This is my 2nd 15 inch MacBook Pro (unibody). The first one was a 2006 model, it lasted me 5 years. The current one was bought mid-2010. Prior to the MacBook Pros, I used a 12 inch G4 MacBook, it lasted me 4 years. I have only occasionally shutdown my Macbooks when I had to fly overseas. I have restarted them due of updates. I have learnt that not shutting Macbooks down and starting them up again when you want to use them accounts for my Macbook’s 4-5 year lifespan. Please do more than only blah, blah, blah to save de Planet. Don’t blame Brazil to destroy your habitat ( only!! ). SHUT DOWN YOUR MAC WHEN NOT USING IT! Do more than just talk! If your Mac has been attacked by a virus or trojan, and that code is attempting to take over but has not yet done so, shutting it down will halt those efforts. With SSDs there is simply no downside to shutting down a Mac–at least at the end of each day. It takes about 15 seconds to boot my 2011 MacBook Air. And, like you said, rebooting resets caches makes available the maximum amount of RAM. Finally, during the day, I let my MacBook Air sleep–but I’ve used terminal commands so that it’s the old kind of sleep where nothing is written to the SSD and the contents are preserved in RAM. I hate the idea of the computer writing 4GB to the SSD the way it does during the default sleep mode. You are still burning the circuits of your Logic board & SSD with the power surge of starting up and shutting down cycle. I’m a bit surprised that the article doesn’t even mention System Preferences/Energy Saver – the options there are quite useful. I leave the Mac on 24/7 and sleep it, and hard drives after 30 minutes of inactivity, with Energy Saver Preferences. It’s also a Media Center – so I turn ON – “Wake For Network Access” – so if I want to access Live TV, Movies, or other Media – from an iPad, phone, media player or other device – it’s always there. I’ve used the power button on my MacBook Pro only once. When I bought my MacBook in 2009 I used that button to initiate its first boot and from then on I’ve never used it. When I’m done, I just close the lid or I just leave it so it goes to sleep after 15 minutes. I only reboot when it tells me it wants to reboot because of a software update. Otherwise I never reboot. I even don’t turn it off while traveling by airplane. I have some AppleScripts that run in the morning, shortly before I get up, so that things I want to see then are waiting for me. These don’t work if the Mac is asleep, so I keep it on. I reboot about once a week to reclaim memory. After a long Adobe Lightroom session today with frequent jumps out to Photoshop and Color Efex Pro, I was still using 6GB of main memory after closing all apps. That’s time to reboot. One thing that was missed here is invoking HIBERNATE mode on the mac. To do this go to Terminal. I use it and it’s great. I can go all weekend and not use my MBP and on Monday have 90% battery still left. Boot up is not as fast as sleep but faster than booting cold. I put it to sleep. My girlfriend shuts it down. It ends up working out, because it should be powered down every once in a while anyway, and I don’t have to worry about doing it myself. haha! I power it off. I’ve heard of too many house fires caused by over heating computers. I’d rather it turned off completely while I’m in bed asleep. A bit paranoid, I know, but hey! Glad I came across this page… I’m a new MBP owner and was confused about the whole sleep scenario. Would you power users recommend leaving the AC connected while sleeping? or unplug it…. 2 things- Sometimes my iMac -still running on the original Intel Core Duo- will start getting a little slow after a week or two of running (with sleeping), so I will shut it down and it runs much better the next time I turn it on. But from the posts/ article, it looks like I should just restart it instead? Clearing the cache is mentioned; could that be an issue, and if so is restart/shut down the only way to clear it? My other question is, does anyone have any kind of info on how much power it takes to wake a Mac? What is the threshold where it uses less power to just leave it for a while as opposed to sleeping it? 15 minutes, 30, an hour? I turn it off completely it when I’m going to sleep or not going to be using for more than a few hours. Like to give the components a chance to cool and “rest.” In addition, why use electricity unnecessarily. I also like it to fresh reboot from a full “off” position everyday to clear memory, etc. I have it set to boot up automatically just before I get to the office every day. So, when I sit down all is running, mail retrieved, etc. I have assorted machine..several Mac pros,a lapto, an iMac. I use some daily and others moe sporadically. I can appreciate those that sleep their machines. I on the hand have hard rives that are still for a few years and start right up which for one thing is the result of using magnetic bearings. I have eleven drives running concurrently and though some sleep, some do not and thus I I think shutting down the motherboard is a good thing. I have had two drives fail since .1994. I always shut the entire system at least every night. The two drives were elderly with bearings tat were not of the mag elevated type. This stat is based on a population f 40 drives. Keep it or shut it own, life is. Too short to worry either way. +1 for the Hibernate alternative, but instead of using command line as Greg pointed out above, I use the “Deep Sleep” Dashboard widget, on a black Macbook with SSD drive. OR YOU ARE GIVING THE DEEP SLEEP IDEA? Computers are supposed to work for us, not the other way around. Don’t cater to what you think is best for the computer, do whatever you want to do and what works best for you. If sleeping it is more convenient and saves more energy than leaving it on all the time (it does), then you should do that and not worry. By the time a hard drive fails or whatever, the money in electricity bills savings you would have accumulated versus having left a computer on constantly, will have more than made up for the cost of a new hard drive or even a new computer. This is by far the best answer out of all of these in my opinion. Once you loose all your stuff (Murphy is clever:-)…. Either Way you may never loose. They usually don’t stop running when they are left on. (if I just had not put it to sleep) Drives go into comas. I frequently have running downloads, so I just leave my iMac on all the time. If the downloads are stopped or completed, the iMac sleeps after a while. If not, it continues downloading. I don’t have to do anything. It just works! However, I let the MacBook sleep by closing the lid because I never have any downloads running on it. Thank you all for sharing your tips. I wanted to know one more thing. I have a laptop (MBP late 2011). I know that during the beginning of OS X, when sleeping the computer, the HD heads were not parked, so if the laptop was moved too vigorously, the heads would damage the HD disk. So, when moving my computer (going to school / work, flying…), I always shut it down. What about now ? Can I carry my laptop in my backpack without shutting it up, just sleeping it ? I thought this article was going to address balancing thermal stress vs. corrosion. If you leave any micro-electronic device turned off for an extended period of time, corrosion will erode the tiny circuits and switches. If you leave it on, the heat generated by the circuits will prevent moisture from corroding the parts. On the other hand, turning it off and on all the time may introduce thermal stresses or even current spikes that can eventually break one or more of the millions of microscopic connections inside the chips, display array, and hard drive. So in a humid environment, it might be best to leave the computer ON all of the time to prevent corrosion, in a very dry environment, it might be best to turn it off when not in use to save power. Bottom line: If you are not in one of these extreme environments, the question of ON/OFF/SLEEP is not really an issue. Sleep it when you are not going to use it for more than an hour, and just reboot when things stop working right. I sleep my Macs. I have an PM iMac G4 that I move twice a year to/from my summer “house”, that sleeeps when I don’t use it. It is stil doing fine. I have a PB G4 that also sleeps when not in use (usually because I shut the lid). The PB still lives, despite numerous falls. One fall cost me a new HD and loss iof some data, I couldn’t FireWire TargetMode it because it would get stuck on some corrupted files (it booted, but no apps except Finder would run…). So I got all the salvageable stuff over to an external HD & turned it over for a HD replacement. Bottom line? A laptop leads a hard life, the power cycles are not what will kill it. A desktop Mac? If it’s in the same room as you sleep, sleep it, unless you sleep well to humming fans & HDs. Otherwise? I feel bettter sleeping it than having it on when I’m not home, in case something should go wrong. The same goes for TVs and other things: Better turn them all the way off or pull plug from wall, thermostats do fail. Thus, I subscribe to the “sleep” faction. I do not worry about the stressing thing, I have a G3 still kicking (as well as a PM6500 w/PowerPC processor upgrade…). On an antique Mac, perhaps, yes, but newer Macs? No. Keep it off. Hackers can remotely turn your PC on when you are asleep and do all sorts of nasty things to you. I shut down when I notice I have started a big Ram Disk swap. Right now I only have 200MB of disk swap. I run my laptop with 4 gigs of ram. So its rare it builds up to two gigs. I may also shut down if I take the computer some wheres and its going to be a long walk. Like to the cyber cafe. If im out I will sleep alot of the time, if im at home I might sleep once in a while or always at night, unless I have torrents going, Then its on 24-7. My PC Crap-tower p4 I tend to leave off most the time and only use it for extra storage as it has a portable usb drive I can not use on my mac because of the USB is not high powered. I’ve read all these comments with interest. I’m running an iMac which I tend to just sleep each night unless I’m going out somewhere as I’m concerned about security (something no one has addressed – if it’s switched off it needs a password to reboot otherwise it just wakes up to whatever was open before). I have had to turn it off by the button a couple of times when it seems to have crashed and won’t respond but for the majority of time I sleep it. It seems to get very hot though if i leave it on so worries me it may cause a fire overnight. We have 2 ipads and an iphone all of which are on permanently so the ‘leave on’ option seems to make sense. Can anyone comment on leaving a Windows based pc on permanently too – I also run a Dell Vostro 360 which is very similar to the imac in that it’s all built into the large 23″ screen. I turn this off every night – would it be better to sleep this too? I am an ACMT with 2 Macs. My home Mac (once a G5, then a Mac Pro, more recently an Intel Mac Mini) is always on. I use my MBP with a combination of sleep and shut down. Apple suggests NOT to shut down your Mac if you plan to use it in the next 6 hours. So, if you do, just put it to sleep. For sleep users: it is better to shut down your Mac once in a while; better still clean caches, repair permissions, reboot and empty the trashcan. I might be causing some minor environmental damage here, if anyone listens, but I’ve heard somewhere that sudden temperature changes causes defects in the materials, and that this leads to more wear, than keeping the computer on. So turning your computer on and off will actually shorten the lifespan of the components. I normally turn off my G5 when I don’t use it. It’s power cunsumption is far too high to let it on constantly. For short intervals I put it to sleep. Power consumption is still kinda high but it allows me to continue work where I left off. And because of the SSD boot up takes less than a minute (which I can wait). This is an interesting little topic. I’ll add my 2 cents to keep this comments section alive: I’ve had an iMac for a year now and I quickly learned that sleeping it was just annoying and made no sense, since it disconnected from the network and interrupted stuff like torrent downloads (all legal stuff, I promise). I’d rather keep the drives spinning and the connection active, so I put the Sleep slider to “Never” and I just sleep the display when I step away. I use it every day. On the rare occasion when I leave for a weekend or 5 days or whatever, I just leave it running with the display asleep, same as if I were in the house. I’ve never had any issues with this machine. Time will tell, of course, but so far so good. FWIW, I’ve been known to maintain a lean mean machine in the past: all my PCs and Macs have lasted well beyond their normal shelf life with plenty of fight left in ’em. Good to know. I guess I will be putting my Air to “Sleep” more than shutting down now. I’ve just been on the phone with tech support over a fan noise issue that just started about of month ago after a year and a half of silent performance. The tech rep told me that being in sleep mode for extended periods of time was bad. By “extended” I told her that basically I sleep it over night, while I’m at work, etc. She didn’t specify whether the heating/cooling cycles and such were the culprit. I thought this was odd, but she was hinting that coming out of sleep mode might be wearing down the fan. There doesn’t seem to be a whole lot of other explanation for it. But, I have to admit it does quiet down a bit once it’s been running for a while. I affiliate myself with the “sleep” camp. I have a mid-2010 MacBook Pro. I’ll put it to sleep every night before bed and every morning before I leave for work. Otherwise, I let it put itself to sleep when not in use. I only shut it down when I have to pack it up to travel somewhere or when I do system updates. After several Nightmares, One becomes paranoid of sleep. Does all these comments applies for a macbook pro, where you have to move it from a place to another in the car for example ?! I’ve used Mac computers professionally since 1988 and at home since 1999. I had the very first generation 1.6 GHz Mac Pro tower computer when it came out and had it on all the time (ALL the time) and I don’t sleep my computers, for 8 years with no problems. The only reason I switched it out for a Mac Mini is it was intel and I needed to run newer software. My Mac Mini 2012 is on all the time, I never put the HD to sleep, on the monitor. In my experience the more constant the operation, the longer the device lasts. The only time I shut down the computers is if I go on a trip or if there’s a thunderstorm. As with any advise it is only advise. If you look at all the previous posts you would still be wondering should I shut down my computer or put it to sleep, and when. I left my MacBook Pro in sleep mode, when fully charged for 24 hours and the battery had drained by 18%. It took 20 minutes to get it fully charged . What ever harm may done by shutting done my computer and starting it up again I am sure will be compensated for by not having to charge that 20% up again. I shut done if I won’t be using again that day, if I will I put the computer into sleep mode. Good night Vienna I am going to sleep. I have a very important question. Lately I kept my computer shut well actually it been shut for half a year without any battery in it. Right now I’m just waiting for my battery from Japan in may. I would like to know will my computer be alright or should I buy new battery now? Please help me I really worried about my computer. Interesting topic here that i’ve looked into many times. I’ve owned my Mac Mini i5 2011 since it came out. The only upgrade I’ve done to it was upgrade the memory. This is my experience. For the first few years of owning this machine, until the past month, I would always sleep my computer. I’ve had to force shut it a few times because it was giving me trouble. Usually every time after waking it up it would always be a pain.. programs would take a while to boot up correctly.. some times I would just see a loading screen, forcing me to wait for every program to boot up. Really it was becoming annoying, especially times when i needed it right away! Computer is getting a little old and it has a ton of stuff in it, but it still runs strong. I hope it stays this way. I always think it is a good idea to turn off your machine when not in use for a while, say over a weekend or longer. What I think most of these comments are missing is CONTEXT per computer user specs. What kinds of applications are running? Launch agents? Launch daemons? Do you REALLY need Spotify open 24/7? Or your web browser? The only people I have ever known who complain about their computer being slow or having problems are the ones who leave their computers constantly running, with 4+ apps open, Wi-Fi & bluetooth pumping, and so many processes working in the background I’m surprised they can’t feel the vibrations on their skin. From personal experience, turning off my machine at least once a week for however long, has done nothing but help it’s speed and cleanliness, among other maintenance duties as a responsible computer owner. I have a 2013 MacPro; it came with a ridiculous 256gb ssd, I got it three days after it was available. Should have waited for the 512gb. I immediately got the 1tb OWC SSD 3rd party. It worked well till it didn’t. When I closed and rebooted, I got a utility screen, time machine or else. I don’t have time to Time Machine 680gb. I sent it back for advanced replacement. After three months it happened again. This time I figured out how to fix it. I removed the lid and unplugged the OWC SSD, like a hard ssd boot. Plugged it all back in and it started normally. Every time I reboot I have to do the same thing. But OWC cannot replicate so I got the SSD back. Now I just sleep it; I have 64gb and ramm cleaner app. My only worry is it gets hot, and I hate Apple for not even selling me a 512ssd used or new, just go away after giving us $3,000 for a six-core 16gb 256. What pro uses 16bg, I’m at 32gb within 5 minutes of work. So, $1600 more for OWC 1tb ssd $800 and great $700 for 64gb ramm from B&H. Now I’m in OWC’s black book, no more advanced replacement, must authorize $800 on my card before they send a new 1tb ssd unit, but I know it will have the same problem. I don’t trust them, they never can reproduce my problem, and who’s to say they try that hard to reproduce it. All comments above are very interesting..I have analyzing Reliability, causes, and effects for many years on DOD programs per MIL STD “x and 33x and using assemblies and designs per MIL STD, at several quality levels, including comercial items, such as APPLE´s consumer products. 2. Item used at ambient temperatures, not to exceed manufacture´s specs. ..and last..failures, most cases, occur at turn on on devices..where most component stress occurs ..take any example…on aircrafts take off, turning on any device..?..just think ..stress!